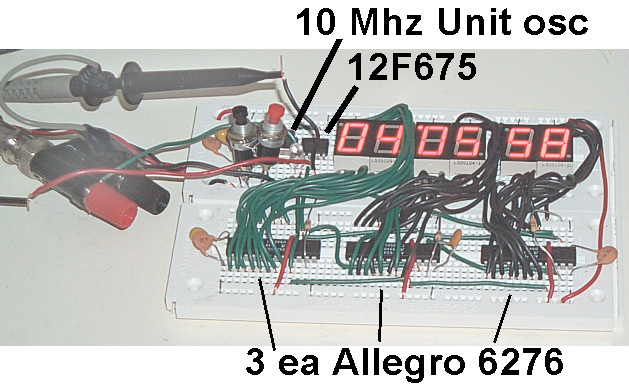 6 Digit LED precision clock (HH:MM:SS) where the uC clock source comes from a precision oscillator at 1, 5, 10 or 20 MHz. Because the frequency division is in software it's possible to divide non standard frequencies down to 1 PPS (see below) allowing the use of lower cost yet very high quality oscillators as time bases. Altough I have the TAC32 software and a GPS receiver with it's serial port connected to my computer, I don't normally run the software. I would like to have a hardware clock driven by my precsion oscillators as a check of their health. It may be possible to offer an optional version that would display Sidereal time for astronomical use by swapping the uC for one with a different program. By arranging the digits side by side and using the decimal point as the separator between hours an minutes and a blinking decimal point between minutes and seconds the display might also be used as a frequency or time counter with a different microcontroller installed. Developing the software routines for the three projects below using the PIC 16F870. This chip has the same modules needed for the MM5369A products below and has a number of extra I/O pins that can be used for development. It also is more cost effective than using a smaller PIC for the 6 Digit Precision Clock than using a smaller PIC and then adding extra chips to get the needed I/O pins. 28 Oct 2002 - received prototype PCB and after fixing the errors have the 1 PPS output and 6 digits turning on. 19 Nov 2002 - Investigating the idea of using a 12F675 8 pin PIC 6 digit clock (maybe more) that would be able to drive any size of LED digits. Starting prototype to try out the idea. No RS-232, only runs from 10 MHz unit oscillator. Many years ago National Semiconductor made an IC that contained an oscillator that worked with the common color burst crystal (3.579545 MHz) and divided down to a 60 Hz output. This part is now obsolete. To make a replacement today it costs less to use a unit oscillator than it does to use a separate crystal and loading caps. Also using a microcontroller allows either 50 or 60 Hz outputs as well as a 1 Pulse Per Second output. 1 Pulse Per Second Output with 200 ms on time for either 50 or 60 Hz output. adding a first order frequency correction since there is no frequency adjustment on the unit oscillator. This changed the 1PPS period from 1.000,008 Seconds to 1.000,000,2 seconds, an improvement of about 40 times. 15 October 2002 - 12 MHz was chosen because it's evenly divisible by both 100 and 120 allowing the generation of either 50 or 60 Hz, but a better choice would be 20 MHz because it's the highest rated frequency for most of the modern PIC chips. Most low cost unit oscillators have a frequency tolerance of 100 ppm (Parts Per Million) including voltage and temperature and 30 days of aging which translates to 2,000 Hz in 20 MHz. On the 20.0 MHz unit oscillator I have the frequency was fast by about 100 Hz. So the correction for starting frequency would also correct for the 120 and 100 division. The higher frequency translates into finer corrections. The inexpensive unit oscillators behave about like a plain crystal in terms of frequency errors due to temperature and aging. It may be possible to greatly reduce these errors not be trying to control the frequency but rather by controlling the 50/60 Hz output and the 1 PPS output. This requires both temperature sensing and characterization of the oscillator being used for not only it's current frequency but also how the frequency changes with time (aging rate). Since crystal oscillators are many orders of magnitude poorer than atomic frequency standards the crystal aging can be characterized in a relatively short time when an atomic standard is used as the reference. Maybe allow programming delta changes to the corrections at power up? The 12F675 has a small EEPROM data memory so could remember these changes. This EEPROM memory is needed to make the aging correction. The 1 PPS LED can be used to indicate which mode was selected during the power up sequence then it changes to the 1 PPS heartbeat. An alternate use of AN1 might be to use a pot that has no stops and allow continuos frequency correction similar to a variable cap on a crystal but with way more range and resolution. There are a number of oscillators on the market (eBay) that have output frequencies that are not the classical precision oscillator frequencies (1, 5 and 10 MHz). For example the FEI model FE-2163A is a very high quality double oven unit with extremely good specs but it's frequency is 10,054,347.8 Hz.. I think this frequency can be divided down to exactly 1 PPS using a uC allowing it's use as a precision time standard. Table of common crystal and unit oscillator frequencies and their factors, typically 2, 3 and 5. Up to 30 MHz which is the highest I have seen a 16F870 or 16F873A run. The 1PPS output from the uC when it is driven from a Precision 10 MHz source (PRS10) shows noise at the 100 nano second level. I think this is due to jitter introduced by the uC. By using an add instruction rather than a simple move in the PIC interrupt routine the position of the load command for Timer 1 is not critical. The 20 MHz unit oscillator I'm using with the 16F870 is high by about 100 Hz on my bench. If a Quartz Halogen lamp is lowered to about 4" above the oscillator it will come very close to 20.0000000 MHz. I think the temperature at the oscillator is around 100 deg F when the lamp it lowered. The 12.0 MHz crystal is low in frequency resulting in a slow period of 1.0000077 seconds. When heated the frequency goes even lower, opposite in temperature response from the 20.0 MHz unit oscillator. 25 Oct 2002 - Plotting the frequency vs. Temp on the CTS MX045HS-20.0000 (Digikey CTX169) shows the turning point to be around 48 deg C and is the lowest frequency at any temperature. The frequency is aging down about 3 Hz per day while the temperature is held near the turning point. This 1/2 size unit oscillator is their lowest spec at 100 ppm over voltage, temperature and 30 days of aging. My Fluke temperature sensor indicates the the temperature has gone down from 53.5 to 48.0 deg C in three days, 5 hours, but I have not changed the setting of the proportional temperature controller. Maybe the temperature has gone down, but that would cause the frequency to go up so it's more likely that the temperature sensor is not that accurate. Need to install a good thermocouple on the oscillator can. 25 Oct 2002 - Prototype Printed Circuit Boards for the 6 digit precision clock should be here today and the parts to stuff the board. 29 Oct 2002 - stopped working with the CTS MX045 - it continues to drift down in frequency 2 Hz per day and according to the Wenzel web page on quartz crystal oscillator aging this indicates a bad unit (probably a leaking package). CTS has no on line tech support. Starting to test the Jameco 20 MHz full size unit oscillator. Doing this by using the PIC 16F870 that has a single 7 segment digit sequentially displaying 4 hex digits that is the voltage due to a thermister. This way there will be two independent temperature checks. Although the temperature is now 44 C heading for the old turning point near 50 C, the frequency is low by 400 Hz, so this oscillator does not have as good an initial frequency as the CTS unit. 9 Nov 2002 - After finding turning point of Jameco 20 MHz oscillator at about 55 deg C the frequency still jumps up and down a few Hz, very poor Allan variance at 1 second interval. The temperature plot is similar to the CTS unit oscillator, a minimum frequency around 50 C and higher frequency on either side. The prototype clock is now counting time in a stable manner and no ghosting between digits was solved by turning off the segments prior to switching digits. By using the HP/Agilent 8648A Signal Generator to feed the Precision Clock the count rate can be made much faster (up to 30 MHz for the 16F873A) or slower as a diagnostic tool. The Yellow 7 segment digits are easier to focus for my eyes than the red digits. The Piher 5 k Ohm pot (lower left in photo) with no mechanical stop can be combined with a pushbutton switch so that one A/D PIC pin can report both a button press and the pot position. If the electrical 340 degrees is divided up into 16 segments the PIC will report absolute position within the first 13 segments reliably, but not all 16 due to pot non linearity. Now need to implement rollover as the pot is turned past zero to make a multiturn pot with an unlimited number of turns. Note that there may be a way to stack two of these to make a low cost 360 degree position encoder. 21 Nov 2002 - a different Jameco 10 Mhz Pletronics oscillator used in the prototype 12F675 6 digit clock using Allegro 6276 digit drivers has an Allan variance on the 1 PPS output of about 113 pS and the 1 PPS period is about 1.000,003,445,405 seconds. 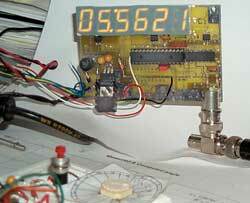 26 Nov 2002 - The PIC 12F675 based clock is now counting time with wiring that matches the design of a single sided PCB. With the Allegro 6276 serial LED drivers only 3 PIC pins are needed for the display and the display is only updated when there is a change making the software much simpler than for a muxed display. Also the LEDs are on constantly and their brightness is controlled by a set resistor so the brightness can be very good, now it's limited by the current capability of the the HP 6216A power supply, but is easily changed via the current set resistors. I set the time displayed on the 12F675 clock to be within a fraction of a second of the time shown on the 16F843A clock. The 16F843A is driven from a Rb locked oscillator and the 12F675 is driven from a low cost 10 MHz unit oscillator. Within 8 hours they differ by just under 1 second. This table will give you some idea of how the quality of the oscillator impacts time keeping. For many months the FTS4060 Cesium standard has a measured stability in the area of a few parts in E-13. An oscillator at 1E-8 would make a clock that's good to much better than 1 second per year if you correct for the aging. Note 1: A 10 MHz unit oscillator driving a PIC microcontroller will have an instruction time of 4/Fosc = 400 ns, so the time in this column is how often the PIC would need to change the divisor used to count down to one second to correct for crystal aging. Note 2: If the time interval between zero crossings of a 10 MHz signal is used there will be rollover seperated by a TI of 100 ns, i.e. the period of a 10 MHz signal. If you can go for many days without a rollover then you're working with an atomic standard. Note3 : By averaging the 1 PPS from a GPS receiver with everything else optimized you can get about 1 ns for a day's worth of data. The newer Carrier Phase GPS Time Transfer method is good for about 3 ns on a second by second bases and could be averaged to improve that. This change per day is the practical number here, most quality time interval counters, like the SR620 or the HP 53-- series can repeatably measure in the 1 ps range. In addition to the stability above there are frequency errors due to the initial frequency setting and due to temperature changes. The above table could be used where "stability" means only aging or it could be used where "stability" means the combined stability due to some specified list of parameters like initial aging plus temperature plus supply voltage, etc. 6 Dec 2002 - Very minor temperature changes show up in the oscillator frequency. A desk lamp shining on the unit oscillator from 3 feet away will change it's frequency by a few Hz. When a cold oscillator is first turned on it takes a number of minutes for it to warm up and in the process it drifts more than 10 Hz. Insulation of the unit oscillator to minimize the temperature fluctionations is desirable. In terms of a test method looking at only the delta between the 12F675 1PPS output and the house 1PPS is not enough. That data needs to be saved or the test needs to be done at an interval of 24 hours in order to see how well the clock can measure a full day. By doing this minor fluctuations will have a chance to be averaged out. For example if there is a time lag between an oscillator temperature change and the correction there will be some error as the temperature rises and there will also be an error as the temperature falls but the cumulative effect of the two errors will tend to cancel each other. 17 Dec 2002 - have been testing the Rakon - CX0600C 10.0 MHz unit oscillator. Looking good so far. These are reasonably priced. Note that you can not measure aging on a room temperature crystal or unit oscillator because the variations due to temperature over shadow the aging unless you wait a very long time (maybe years). By using a thermistor on the Rakon case with some Silicon grease the case temperature can be monitored. At around 55 deg C the Frequency vs. Temperature curve is at a turning point and here hopefully the aging can be seen in a matter of days. 29 Dec 2002 - the Rakon 10 MHz unit oscillator is drifting down in frequency at 16 ppm per year and appears linear after 17 days at 62 deg c. The factory thinks that +/- 5 ppm is where they should be, so maybe it needs a few more weeks to settle down? 7 Jan 2003 - Working on 6 digit 0.56" char ht LED board with 3 each 6276 chips. Voltage sensivity of Sentry 20 MHz unit oscillator is about 367 Hz per volt (nominal 5.0 Volt supply). Common 3 terminal voltage regulators have less than 0.1% change over the 0 to 50 deg C range. This translates to 0.1 * 1/100 * 5 V * 367 Hz/V = 1.8 Hz over temp due to voltage stability of the oscillator. 20 Feb '03 - stopped testing the Rakon sample #2 - is't drifting down in frequency about 2 Hz per day. It and the CTS sample (see 29 Oct '02 above) apparently are leakers. Maybe these two were assembled in facilities with poor QA? 20 Feb '03 - The Sentry oscillator has been running at room temp will now be moved into the temperature chamber. 22 Feb. '03 - After the frist couple of days The frequency seems to be drifting down about 0.01 Hz per day, but it's still early. 22 Feb. '03 - Have received the prototype LED1 single sided printed circuit boards. Holds 6 each 0.56" character height 7 segment LED digits. The digits can be installed all right side up to provide a pure numeric display with decimal points with each digit, or every other digit can be installed upside down providing a ":" resulting in a clock hh:mm:ss display. It uses 3 each Allegro 6276 driver ICs. The board has 8 pin 0.1" headers on each side so multiple boards can ba cascaded to a 6, 12, 18, 24, 30 digit display. 1 March 2003 - some parts, indlucing the PC2 PCBs have arrived, but not all of them. 1 March 2003 - The sentry oscillator's iinitial rate was aging down in frequency at 1 Hz per day, but the rate is now slowing. 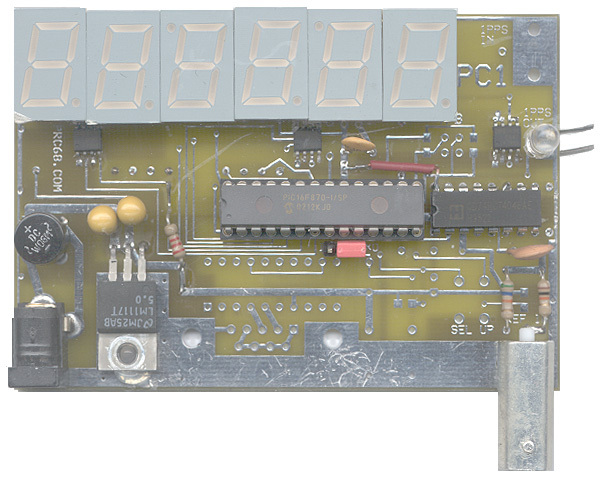 16 March 2003 - New web page for LED1 Display & 12F675 based PC2 clock. 16 March 2003 - The Sentry 20 MHz Frequency vs. time is very close to a parabolic curve. This may be due to cleaner manufacturing than the other unit oscillators. Note that the lower frequency crystal blanks are thicker so that the aging is proportionally less. 18 May 2003 - The Sentry oscillator is following y = 1E-08 X^2 - 0.0026X + 1E+07 (Excel equation, not accurate) so in 12.5 weeks the frequency has gone down by 35 Hertz. 17 April 2004 - The Sentry oscillator has been running in the 120 F oven for about 395 days and the aging rate has now decreased substantially. y = -35.858Ln(x) - 84.952 R2 = 0.9933 the raw data into this plot is the frequency difference from 20,000.00000000 MHz, the nominal oscillator frequency. x is the number of minutes computed from the time and date. 4/17/04 9:16 am is x= 683893 minutes since the start of testing (12/29/02 11:13 am) and the offset (y) from exactly 20 MHz is 1,121.343 Hz. The SR620 counter is actually measuring the period of the 1 PPS output from the PIC down counter and the actual frequency es calculated in the spreadsheet. At the start of the test the frequency was low by about 980 Hz and now after 395 days of high temp operation it's about 1,120 Hz low. At the start of the test it took about 20 days to age down by 20 Hz. The last 20 Hz decrease has taken about 136 days and the. For a few decades the second has been defined based on the atomic physics of Cesium. For all the centuries prior the second was defined based on the rotation of the earth. The switch was made because there are a number of irregularities in the earth's rotation and so it's not that good of a time keeper. All precision oscillators have a means of adjusting their frequency, none of them turn on and run at exactly their nominal rate. But the newer Cesium standards do come very close. First and second generation Cesium standards have a manual "C Field" adjustment to adjust their frequency. But even when not adjusted the frequency of a Cesium standard stays at a constant frequency, i.e. it does not have aging. All other oscillators like lab grade crystal or Rubidium oscillators change frequency with time, i.e. they age. A good oscillator, like a good wine, ages well. That's to say that as the running time increases the rate of aging decreases. For a good crystal oscillator after say 6 months of operation the aging rate might get down to parts in E-9 or E-10. The aging at this point is predictable and can be accounted for either by changing the fine tuning or be predicting the frequency and changing the divisor to get to one second. Note that precision crystal oscillators need to be calibrated at some time interval (6 months, a year, etc.). At the time of calibration the frequency is not set to be spot on, but rather is set to be off by the maximum allowable amount that's within spec, but so that spot on is in the direction of the again. This way at one half of the calibration interval the frequency will be spot on and at the end of the cal interval it will be right at the spec limit. This way you get the maximum length cal interval for a given spec. The constant term in the equation came out to be exactly 20 MHz instead of some other value due to a bug in Excell. put oscillator into a thermos bottle to insulate it from temperature changes. put oscillator into a PVC pipe that goes down into the Earth some number of feet where the temperature does not change much. These links are about a method where a fixed Timer count is used and so results in a jitter on the 1 PPS output as large as the size of the Timer count. A much better way is to accumulate the fractional timer count error and add one count to the last count of the second and subtract 1 from the fractional error counter. This way the jitter is limited to one timer count = 1 instruction count = 4/Fosc. Of course this requires using a different value for the Timer count at different times in one second. For the FEI FE-2163 double oven 10,054,347.8 Hz oscillator this would translate to 99 rollovers at a Timer1 count of 25,058 and a nominal last count of 32,844, but because of the fractional part overflow for 19 seconds in a row the last count would be 32,845 and once every twenty seconds the last count would be 32,844 resulting in zero error and jitter less than 397.8378 nanoseconds.